Today we are continuing the drill campaign at our red Jura target "Rock Hall." The focus of this weekend's plan is the dropoff of the Rock Hall sample to the SAM (Sample Analysis at Mars) instrument, which will occur on Sol 2281. 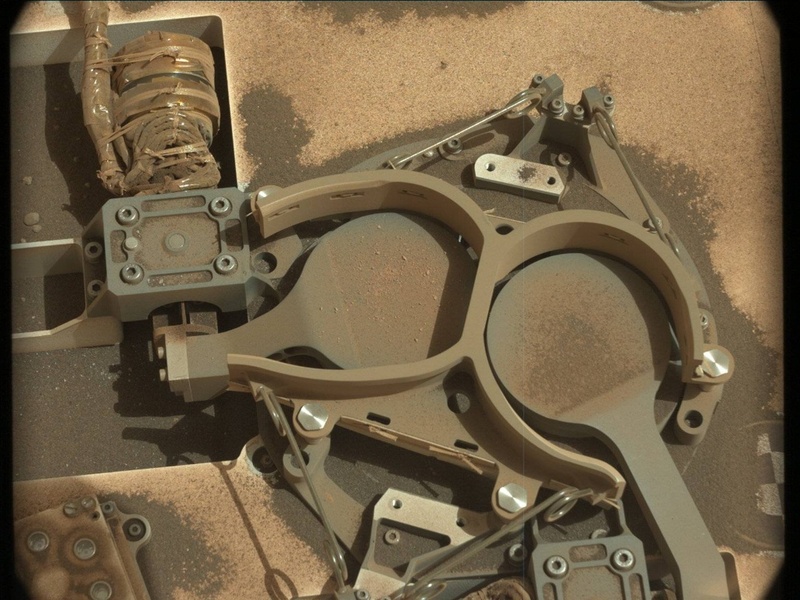 During the delivery process, Curiosity will open one of the SAM inlet covers (pictured above) and the rover arm will deposit a portion of the fine rock powder from the drill bit. SAM will then incrementally heat the sample up to very high temperatures and the gases released by this heating process will be analyzed to better understand the chemical and mineralogic components of Rock Hall. The SAM results will be extremely important for complementing the chemical observations from APXS and ChemCam, as well as the recent mineralogic results from CheMin. There was also plenty of time for other science observations in addition to SAM. On Sol 2282, we will survey for dust devils with Navcam, and will also take ChemCam measurements of the Rock Hall drill hole to fill out our suite of data for this drill target. On Sol 2283, we planned two science blocks, starting with an early morning block dedicated to atmospheric monitoring activities. Afterwards, we will take ChemCam measurements of "St Cyrus," a workspace target intended to continue our documentation of bedrock in this area, and "Gometra," a target that may be a meteorite candidate. We will also be taking a Mastcam right camera image of "Gruinard Bay," which is a displaced slab that was identified in the Mastcam left camera images as having edges with interesting textures and color variations; the higher resolution of the Mastcam right camera will allow us to take a closer look at these textures and the interactions between this slab and the regolith around it. Overall, this was a pretty smooth planning day today, especially for me as the Geology Keeper of the Plan, and we're looking forward to seeing the results from SAM soon!